This interesting illustration, printed in the Dublin University Magazine (Vol. XIV, 1839, facing p. 638) is probably the oldest depiction we have of the Kildare Harp, which shows Petrie sitting in a chair alongside it. Although the date when he bought it is still unknown, the publication of this illustration proves that it was in his possession prior to 1839. This really splendid Harp was obtained by the late Dr. George Petrie from a poor old woman who had purchased it at an auction in Dublin. 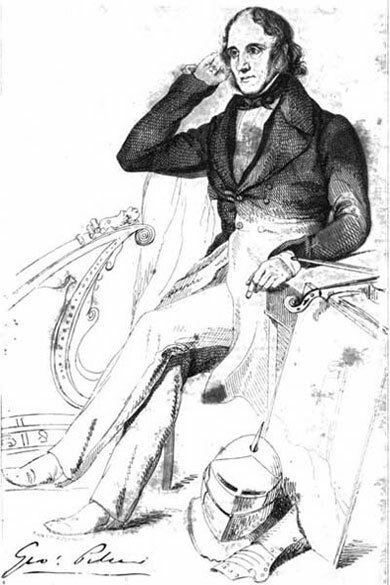 Dr. Petrie upon discovering for whom it had been made thought that it should belong to the head of the family, and presented it to the fourth Duke of Leinster in 1849, since which time it has been preserved at Kilkea Castle and has been known as the Kildare Harp. This harp is strung with brass wire of different thicknesses. These strings may not be very old, but they are probably of the correct gauge, as the stringing of the harp was understood in 1849. It can be deduced from the statement that some time before making the gift in 1849, Petrie himself had paid for the harp to be refurbished. If what he thought desirable included restoring the harp beyond the stage of mere ornament so that it would work as a playable instrument, then this is likely to have required the reinforcing of potentially weakened or damaged areas and the fitting of new brass strings of an appropriate gauge (as Armstrongs comment implies). As might be expected for an instrument of this age, the Kildare Harp has accumulated its fair share of wear and tear over the years. A close examination reveals signs of numerous repairs, including attempts to strengthen the neck and the patching or reinforcing of worn and damaged areas on the soundbox (applied both internally and externally), etc. Some of these are fairly simple, almost crude, and of a purely practical nature while others have been undertaken with a great deal of care and skill. There is reason to believe that this harp may have undergone refurbishment work on as many as four separate occasions, and possibly more. Although it is beyond the scope of this short article to explore these various repairs in detail , one reinforcement may be of particular interest. This is a modification done with a high level of craftsmanship which appears to have been intended not only to strengthen the harp but also to preserve as much of its original character as possible. At some stage in its life metal plates were added to the harp for the purpose of strengthening the neck and its joint with the forepillar. These plates were cut and sunk into the surface of both sides as well as across the join with the pillar in such a manner that the surface of the plates appear flush with the sides of the neck and pillar; and they were then secured firmly in place by numerous countersunk screws. But it was not just the neck and pillar joint which were reinforced: at the other end of the neck specially cut and shaped metal strips were also recessed into the two sides and along the line of the lower edge where the tuning pins passed through. 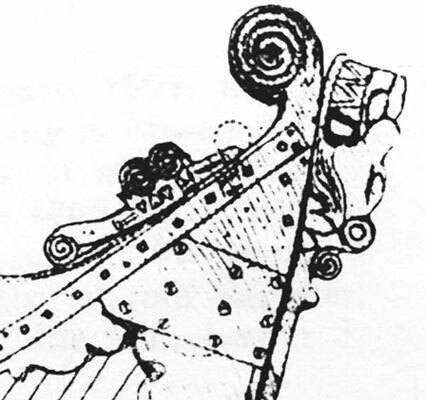 Part of a drawing of the Kildare harp made in 1895 by Gerald Wakeman, which shows the reinforcement plates in situ. The full drawing may be seen on our Kildare Harp Dates page. The reason these plates may be relevant to the dating is that they do not appear on the sketch of Petrie sitting beside the harp (illustrated at the top of this page) which was published in 1839. Although in this depiction the instrument is only drawn in simple lines (and it thus could be argued that the artist merely chose to omit them) it is noteworthy that much of the characteristic carving, as well as the thin metal band used as a repair across the soundbox, has been included. Though this sketch in itself does not constitute definitive proof, the fact that it does not show these plates argues that the reinforcement does not date prior to 1839. If, as seems likely, this harp underwent refurbishment some time around the middle of the 19th century, it could have been the Dublin harpmaker Francis Hewson who undertook the actual work. He was in the right place at the right time and possessed the requisite skills and equipment. However, for the moment this should remain as conjecture. Robert Bruce Armstrong, The Irish and Highland Harps, 1904, p. 72. See also footnote on same page. Lord Walter Fitzgerald. Descriptions of Two Fitzgerald Harps of the Seventeenth Century. Journal of the Kildare Archaeological Society, Vol VIII, No 2, (July 1915), pp 133149. Lord Walter Fitzgerald, op. cit. The strings that can be seen on the harp today are most likely not those that Armstrong noted, and were probably added when the harp underwent further refurbishment in the mid20th century (most of the strings appear to be attached to fairly modern dowels). However, for the record, the author measured the existing strings in August of 2008 and found that the following gauges  of brass or possibly phosphor bronze wire  had been used. From treble to bass they are: 0.40, 0.45, 0.48, 0.55, 0.58, 0.64 mm. See Armstrong, op.cit., p. 72 for his account of some of the repairs relating to the soundbox. From personal observations made by the author as part of a program of examining the harps in the National Museum of Ireland which was taken between 2007 and 2011. A more detailed account of the harps various repairs and restorations will be forthcoming.